khushi sat in front of devi maiyya, her heart was restless, an unstoppable refrain of unsettling thoughts in it, a strange disquiet. some of it to do with shyam ji and suddenly seeing him here. why did he want his car painted black? but really it was something she had felt she’d heard or sensed in arnav ji’s voice that kept touching nerve ends. plucking at them. resonating. “i’ll come…” that’s all he had said. did he say it softly? or was he harsh? what was he saying really? and why could she not stop feeling it echoing in her? khushi looked at devi maiyya, eyes imploring her for help. the day’s events had all been turbulent, there was a throbbing, burgeoning, unbridled pressure rising somewhere… about to erupt. “oh, so you haven’t met payal bitiya’s chahnewala properly yet, only ek jhalak, madhumati ji?” billo mausi’s voice with its ingratiating and insinuating arch wafted in from the sitting room. khushi almost cringed. “why devi maiyya, why is she here? why now?” she thought. somehow that tone of mausi’s held notes of disaster approaching. “arre billo ji, i have spoken to akas babua on the phone when he called to take permission to take payaliya to his home and i have heard from the first day of how polite and courteous he is, so nice always to my sanka devi too… and really, if one is sharp, one need not meet a person one million times to know who they are, one small interaction is all it takes… there is gentleness and goodness in akas babua, and it is in every spec of him. nand kissore ki aseem kripa, aaisan babua humaar payal bitiya ke dwar bhejat hai, itna bada khandan par na ghamand na dikhawa. ah ha ha ha… nand kissore nand kissore…” obviously, bua ji was not one to sit quiet and take billo mausi’s little barbs. “i’ll come…” what was in his voice? khushi started frantically cleaning the small area where devi maiyya sat on the little table. she dusted off the ash from the agarbatti, straightened the diya… removed a drying hibiscus and tucked in properly the fresh one she had put that evening. the batasha? her daily offering of sugar candy? she counted to see if she had given devi maiyya eleven as she had decided to, she picked up the prayer book she read from every day and and was straightening it when something fell from inside it. khushi looked at the tiny little thing that wafted down and settled near devi maiyya’s feet. khushi stared at it caught off guard. and almost at once she felt his fingers, a little rough, yet infinitely tender brushing aside her hair, grazing against the nape of her neck as he tucked a bunch of blood red frangipani on her flowing open tresses. her eyes closed as a longing surged… his fingers seemed to soothe and caress and she could almost feel his lips come closer and hover around her neck, did a breath rustle her hair, play on her skin…? arnav ji. a sigh settled through her. startled, she opened her eyes. her heart seemed to have reached an oasis of calm, she picked up the delicate little flower and looked at it, a sob in her and flowing tenderness. later without any real purpose, almost in a haze, she had pressed a single frangipani in her prayer book. she had forgotten all about it though. 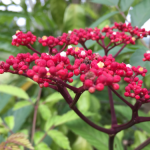 now, delicate and a little papery already, fragile, red deepening to brown, it lay on her palm. “i’ll come…” she heard his voice again. she felt the caress of the feather like pressed petals on her skin. it was ten o’clock exactly when there was a sharp knock on the door. “kaun hai, nand kissore?” said bua ji as she trundled across to open the door just outpacing khushi who had hurried out of the kitchen where she was washing up after dinner. both shashi ji and garima looked at khushi’s expectant face… she seemed to know who it might be. payal was helping khushi and walked out also to see who it was. “arre nand kissore, aap hain, babua, aiye aiye…” bua ji sounded quite pleased to see whoever it was at the door. billo mausi sat up and patted her silver pins in place, curious to know who this “babua” was coming at this late hour. asr walked in looking grim and stern in a black shirt, a dark grey waistcoat, slim fitting dark trousers, and narrow tie in cement green, his hair was brushed back neatly, his eyes were bloodshot. khushi noticed all this in less than a fraction of a sliver of a moment… she knew he was in a terrible state and trying not to let it show. “namaste!” he said curtly, hands folded and with a quick look at all present. 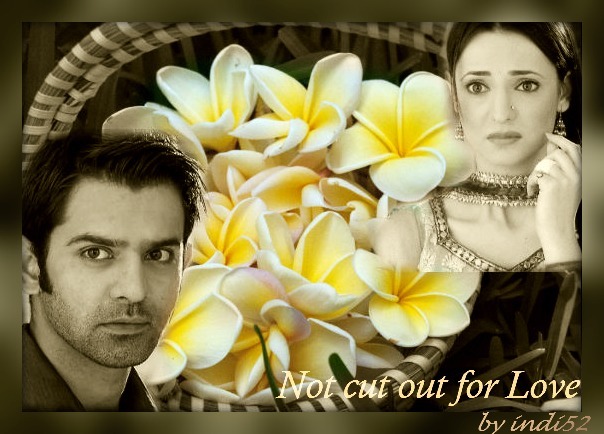 “arnav singh raizada!” he said in a clipped tone before she could finish. billo mausi’s eyes had widened when she saw the handsome dour stranger walk in, she had almost simpered, but when he said he wanted to talk to khushi alone and that too without any preamble or niceties, she almost passed out in excitement, her antenna sussing possibilities for supreme gossip instantly. garima looked nonplussed and darted a glance at shashi gupta. shashi ji had been watching the young man from the moment he’d entered the room… he could sense his daughter’s eyes transfixed on him. it was ten at night and a man they didn’t know had just walked in after a peremptory knock on the door, introduced himself somewhat imperiously and requested to speak to their daughter alone. shashi gupta wondered why that did not shock or worry him. instead he felt the man’s confidence and forthrightness. he looked at asr without saying anything for a moment. “bua ji, you don’t mind i hope…” asr had turned to the lady who reminded him strangely of khushi, well at least in that element of drama they both reveled in, and seemed to sound a little apologetic but his face did not lose that gaunt, emotionless look. “arnav ji, kya kah rah hain aap… do you know how late it is and how can you just…! !” in her need to protect her amma and her babu ji from rumours and damaging conjectures, her voice rose and she glared at the man she wanted to take in her arms and soothe. “hai re nand kissore, ee titaliya…” muttered bua ji under her breath. “shant ho jao, khushi bitiya, ” shashi gupta’s voice was quiet. he turned to the stranger and said, “namaste, i am shashi gupta, mr raizada, you may not remember but you bought sweets from my shop for your show in lucknow…” he smiled pleasantly, almost ignoring the urgency in asr’s voice. asr noted the ease, and funnily he seemed to understand why shashi ji spoke that way. he smiled slightly and said, “the sweets were very good, mr gupta…” sticky syurp on his fine black silk shirt, orange crunchy bits clinging to the syrup and a pair of frightened eyes filling up with tears… he could almost see them right now. that first time he had seen her… he nearly smiled. garima looked at her husband suspiciously, she knew he was going to do something she would not agree with and later she would have to though she would never ever tell him that. “khushi bitiya, please go and talk to mr raizada, we’ll wait for you…” shashi ji said in his usual considered way. billo mausi almost fell off her chair. khushi glared at him, lips pursed… and why did he have to literally translate from english… will you come with me with a little question mark at the end when it really meant, come with me, right now with several exclamation marks at the end. he drove without a word. she fidgeted next to him, wondering what the matter was and in the distance thunder roared. the road was dark, hardly any streetlights anywhere, they were driving toward a highway. he seemed to know where he was headed, he swerved just before the highway started and in minutes they reached a cul de sac, he stopped the car. with jagged rushed movements, he unbuckled his seat belt, got out of the car, came around to her side, opened the door and and before she had time to say anything, put his arms around her and pulled her to him, as her head hit his chest she heard a moan rise in him, and a shudder shake his frame. that perhaps was what she needed to let everything else stop mattering. he didn’t say anything, just stayed there crushing her to him, his heart was racing and she could hear it clearly against her ear… then he unlatched her seat belt with an impatient gesture, gathered her in his arms, picked her up and carried her to the back seat of the suv. she remembered the night on agung when he had done just that. and the burning raging fire of that evening. her heart began to pound… a memory and the present moment mingled. he had still not said a thing. his hand moved slowly over her back, sliding down it settled on the rise of her hip and drew her closer, she could feel the thrust of his hard lean body, his pelvic bone against her. a curious excitement seized her. and this this time it did not feel wrong, as if she had a right to feel this. she moved her head slightly and he came up just then, his hard warm slightly desperate lips colliding with hers, he groaned and lunged in… kissing her emphatically, his lips melding with hers, his tongue seeking the tenderness of her mouth, sliding along her pearl like teeth, wanting her, letting her have him. what did he want… whatever he wanted, she would give to him… if that meant he would not look the way he had when he walked in. “khushi!” he murmured, his first word to her. his tongue licked hers tenderly as if loath to let go… and he moved in again to plant a few quick pecks on her lips… but then he drew away. khushi clutched at him, pulling his head back… he looked into her eyes, they had gone dazed with her need, with his caresses… he sighed and let his head fall against her for a second… then he shifted a bit so she lay below and he leaned over, a strange light in his eyes. he moved swiftly and kissed her where her breasts met and plunged into a hollow, her skin tingled and grew warm. she felt him nip her softly. she shivered. his hand came up and cupped a breast, he squeezed gently as if to hear a response from her… she sighed… yes, she wanted him to touch her just there, just like that, she peered down to see his face… it had a curious little smile on it now, his eyes looked lost… khushi lay back feeling better. let him look any way he wanted but not that stony look, there was pain under it, fathoms deep, aeons wide, she wanted to take that away. why was it so important? she had no idea, yet she had to. as he heard her sigh, something triggered in him. he sat up quickly, though he still held on to her. “khushi… main…” he was fumbling for words. arnav ji looking for words? what was the matter? “khushi, marry me!” the words were swift, to the point; his voice urgent, commanding. “what!! !” khushi stared at him… what was wrong with him? or was she hearing things! “shadi karni hogi…” he repeated, calm and in command now. “karni hogi?” what was he saying? confusion and shock thronged khushi. it was bizarre. what was the matter with this man? “yes… now… you have to marry me… and move in with me, tonight. mere saath… mere paas…” and he grasped her suddenly jerking her to him, thrusting against her, embracing her tight. “but you do,” he cut in curtly, “and i will do anything to make sure you are with me… with me, d’you understand? !” his voice rise charged with gussa, igniting against her abrasive tone. she wanted to rage at him and yet, she wanted to ask him how he was, what had anjali ji said, and did he know shyam ji was driving an suv just like his and wanted to paint it black. and what, did he just say she had to marry him? khushi felt dazed… dizzy… yet alive. he groaned again and dragged her into his arms, his face settled on her shoulder burying against her hair… he whispered, “khushi!” he didn’t tell her he was pretty sure it was shyam that had hit lavanya just a couple of hours before. and this man was a low down cad… worse really. he could easily contemplate murder, and act on it in no time. he was dangerous. he had no qualms about not just cheating on his wife… about killing too. shyam was far more ugly than what he had surmised. but he would handle that. for the time being he had to make sure khushi was alright. he heard about lavanya and almost instantly his mind started worrying about khushi. what if shyam thought khushi had seen him in bali with his lover… what if he found out khushi indeed had? how would he protect khushi? not once did asr think of the fact that shyam had tried to frame him as he obviously had… that did not matter… what mattered was what he had to act on instantly. he had to protect her. had to keep her safe. she was his responsibility. he would do everything to make sure no harm came to her. she was not safe here… shyam might get to her here. near him, with him, in his home… she would be fine there, he would make sure… but she had refused to move in with him. there was only one thing to do in which case. “khushi, you must marry me, and stay with me…” his voice was suddenly so gentle. 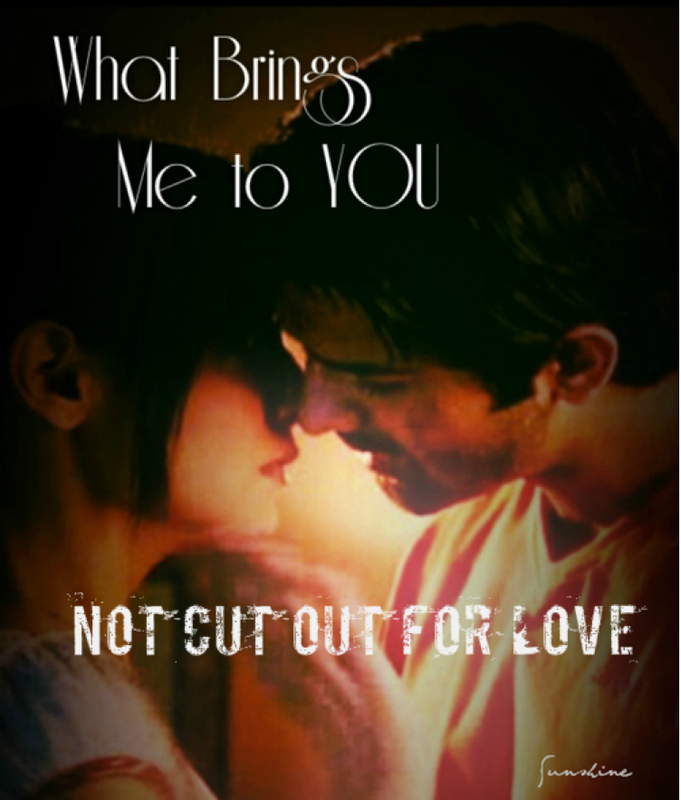 “why must i, arnav ji?” khushi whispered turning her head against his neck, her cheek brushing against his hair, his ear. she wanted to just be there and never have to leave. “i won’t then… no i won’t,” she sprang away from him. what was he doing? “this is not a game, khushi!” his teeth began to clench, a red raw anger drizzled his words. “not a game, exactly, sir!” khushi shot back… “and you are making it one! you want me in your room… your bed…” her hurt anger, her terrifying emotions for him ricocheted in her and her tongue forgot its limits, “so you will marry me now to get what you want… and then… then what… one fine day it’ll be over just as erratically as it had started and what will you say to me then!! khushi, you must leave, you must divorce me??! it is not a…” she would have said game, but he had caught her head and yanked her close and started kissing her brutally by then. there was silence in the back seat interrupted by long moans at times. her cheeks flamed, but she said, “then tell me why you need to marry me…” not forgetting to stress the “need”. khushi stared at him in horror. he was not just laad governior. he was a monster. how coolly he said all this. when all she had wanted to do was make him feel better. how could he? how could he! and she? how could she even want to look at this man let alone… let alone..
she shoved him hard then. she trembled with rage, tears sprang to her eyes. he looked at her face implacably. “okay… not tonight… in a week’s time. i will pick you up and drop you from work… you won’t go anywhere without me… samjhi tum?” he could sense her will flagging. he knew she would do anything for her family, even if she hated him. he winced at the thought a bit, and wondered why the idea of her hating him mattered. he did not want her to. khushi walked back into bua ji’s place looking a little winded. “i’ll come…” his voice seemed lodged in her somewhere. he had just dropped her without saying much and left. yet as the door of the car closed and he strode around to his side, she had heard those two words. everyone was wide awake and in the sitting room waiting for her to return. “ka hui, sanka devi?” bua ji chucked her gently on the shoulder and asked. “bitiya?” amma frowned slightly at her wondering if she was okay. “excuse me, sorry, the door was open… i just wanted to talk to you… about the wedding… i would like to marry khushi… agar aapko aitraaz na ho…” asr had walked into the room and said the words before khushi could even turn around. she was sure he had left. a hush fell across the room… and stretched into the night. he was standing there just as he had a while back… same dark clothes, brushed back hair, imperious turn of head… but no, his face was not stony. he walked up to shashi gupta and then nodded courteously at garima ji, “khushi has agreed but i would appreciate it if you would give your consent… my nani ji and sister will come here tomorrow with the proposal for both your daughters. i hope you will understand khushi and my wish to marry soon… next week…” he turned and looked khushi fully in the eye. his chocolate irises shone and dazzled, her hazel ones glinted back, he gave the most devastatingly loving smile to khushi. she wanted to pick up something and throw at him, maybe that large pickle jar with imli ka achar in it… no, the tamarind pickle was too good to waste on him. khushi’s angry eyes fell on billo mausi, she was staring at arnav ji with her mouth wide open, incomprehension in her eyes. khushi liked that… she wondered what it would feel like to take one of those silver pins and poke into that devil asking to marry her. the thought brought a sweet tremulous smile to her face. asr felt his heart flip and swallowed hard. he had no doubt she meant to injure him mortally. just then the rain came, sounded like a dense heavy shower. have a great read, i am just glad you as a reader are having a good time. thank you. love i feel operates a little outside the purview of logic. poor asr, how hard he tried to be logical.